A selection of Moray Speyside’s finest attractions and locations are being visited by Japan’s Ambassador to the UK this week, as part of a tour to introduce the country’s travel agents to the region. The Japanese Ambassador, Koji Tsuruoka, and his wife, Yooko, are visiting Moray Speyside on Thursday and Friday (17th and 18th May), along with Japanese Minister for Tourism, Jotaro Horiuchi, four tour operators and two representatives from the Japanese tourist board. The purpose is to strengthen tourism links between Scotland and Japan and encourage Japanese tour operators and travel agents to consider the region for inclusion in future itineraries. Yesterday’s itinerary included a visit to Cawdor Castle, near Nairn, the 14th century home of the Thames of Cawdor, built around a 15th century tower house and which originally belonged to Clan Cawdor. The party then enjoyed lunch at the Grade-A listed Georgian mansion, Boath House Hotel, before touring Longmorn Distillery. Highly-regarded Longmorn, is one of the main spirits used to produce the popular Chivas Regal blend. Around 1919, Longmorn’s Master Distiller gave Japan’s ‘father of whisky’, Masataka Taketsuru, a crash course in all aspects of whisky production, including cooperage, malting, distilling and ageing. In the afternoon, the party visited Johnstons of Elgin, which has more than 200 years of tradition and expertise in textile manufacturing. There, they had a brief history of the company and a tour of the premises. Yesterday evening, the party were joined by Cabinet Secretary for Tourism, Fiona Hyslop, for a meal at Blervie House, near Forres. Owners Sheena and Graham Thompson recently achieved a 5* VisitScotland Quality Assurance award after lovingly restoring the listed building. They have already attracted interest from travel trade representatives and bloggers, keen to visit the region. The Ambassador’s visit follows a trip he made to Scotland last summer with his wife and the Minister for Tourism, when they visited Moray Speyside to familiarise themselves with the region before returning this year with the Japanese tour operators. Tourism Secretary Fiona Hyslop said: “Scotland’s heritage and cultural assets are highly regarded around the world, including Japan. 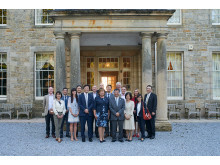 I am pleased therefore that Ambassador Tsuruoka and his party are able to visit Speyside and see for themselves the wonderful tourism experience available in the north east of Scotland. Jo Robinson, VisitScotland Regional Director, said: “We are delighted to be hosting this visit by the Ambassador to Moray Speyside and we have successfully demonstrated what a strong tourism offering the region has for visitors. 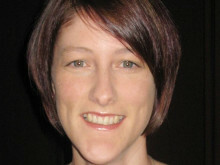 Laurie Piper, Operations Manager at Moray Speyside Tourism, said: “We are delighted to welcome the Ambassador on this return visit to Moray Speyside, malt whisky country. Today (Friday), the group was heading onto Aberdeenshire to visit Balmoral Castle, followed by lunch at the Marcliffe Hotel in Aberdeen and then to view the Thomas Blake Glover collection at Aberdeen Maritime Museum as well as a tour of Thomas Glover House. 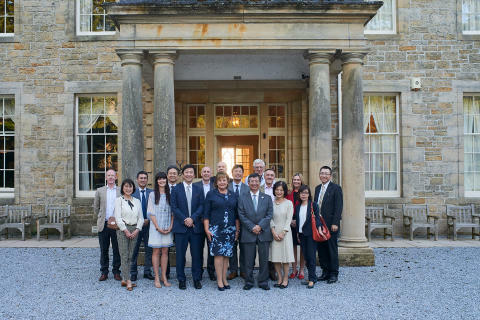 A photograph of the Japanese ambassador and delegation with Cabinet Secretary for Tourism, Fiona Hyslop, at Blervie House.